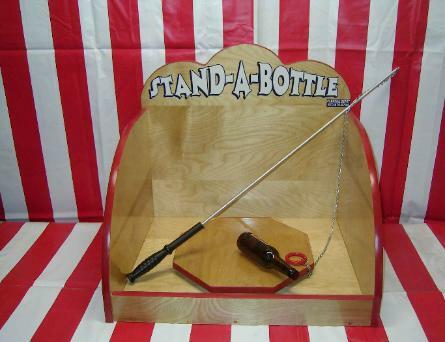 Our Stand Up Bottle Carnival Game will keep your guests challenged as they try to stand a bottle on a platform only using a pole, chain and a ring. The selection of our Carnival Game Rentals will sure have a few games to go with any theme! Stand Up Bottle Carnival Game rental provides a true test of skill and concentration. Players are challenged to lift the bottle with a ring suspended from a string on a short pole. For an extra test the player will need to keep the bottle within a designated area on the game surface. If you are looking for a game to intrigue and involve the older players, this is the choice for your Fun Fair or school carnival event. A volunteer favorite, our Stand A Bottle carnival game rental has no balls to chase or pieces to reset. The set up of the Stand Up Bottle Carnival Game game rental needs a 4,6,8, foot table (8.00 rental) we can also add a carnival red and white vinyl table cover if you want to add the festive feel. 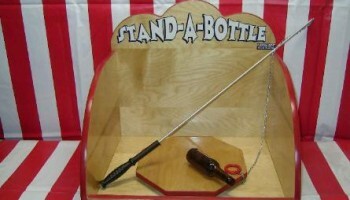 The Target age group for playing Stand Up Bottle carnival game rental would be for 6 years old and up. Players will need to be tall enough to handle the game pieces and also need a steady hand and concentration to master this game. Our requirements will not pertain to every carnival game rental we have in stock our carnival game rentals can be delivered, picked up from our warehouse. We deliver and service all types of events and corporate parties with our huge inventory of carnival game rentals. We provide carnival game rentals to all of Northern California including the San Jose, San Francisco Bay Area. Ask us about a multi carnival game package. Call us if you have any questions about any games. Price: $69.00 for a 4 hr rental. Comes with 1 bottle and a pole with a one ring. No electricity is needed for this Stand Up Bottle Carnival Game.